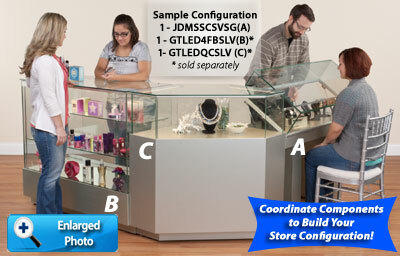 These Sit Down Jewelry Cases for Galleries or Store Fronts are Upscale! Sleek and Glossy, They Highlight Your Gift Collectibles Perfectly. Each of These Sit Down Jewelry Cases has a Unique Lift-Open Gliding Mechanism. Saves $ for your store over time! 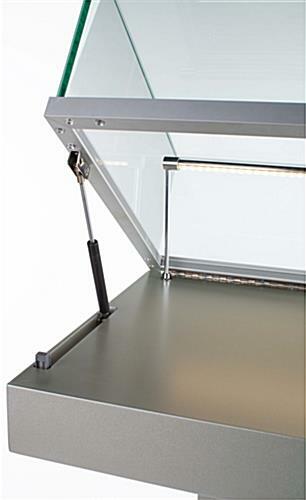 These sit down jewelry cases have hydraulic lift technology to make it easy for employees to lift open the top to select store merchandise. Finished in silver semi-gloss, these retail display units can be mixed and matched with other Grace Tyler custom stands to comprise an entire showroom! These sit down jewelry cases, also known as store showcases from wood like cherry or other materials, work beautifully as a storage unit for artifacts in a museum. 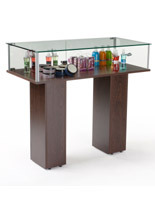 These glass display stand fixtures, such as storage units upgrade the look of your retail shop instantly! 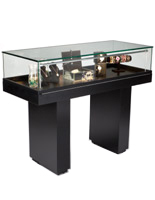 These sit down jewelry cases, also known as custom showcases, are perfect for watches, bangles, rings, fine leather goods, or other saleable shop accessories whether they are made out of wood finishes like the one featured here. Each of these retail display fixtures complements another in the Grace Tyler collection, even those made of cherry. 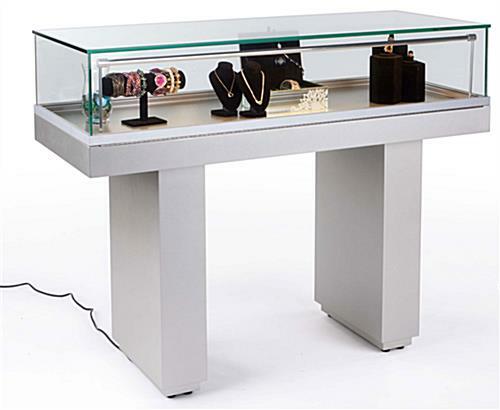 What distinguishes these glass models from other sit down jewelry cases are the LED lighting feature fitted into the silver banister that runs across the front of these store cabinets. Longer lasting than halogen, LED lighting is more cost efficient over time. 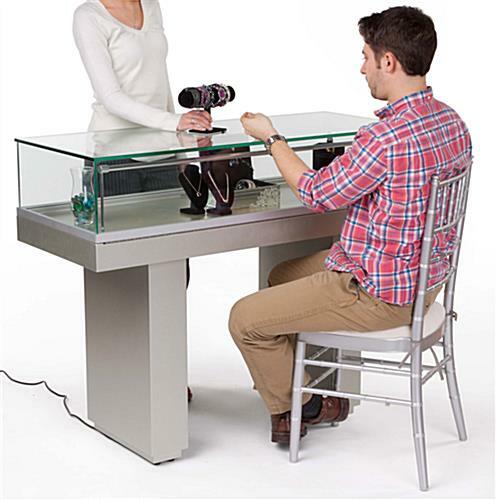 These sit down jewelry cases, wood showcases for retail are also distinguished by a hydraulic lift opening that makes sliding the tempered glass open from the top, a breeze. These storage units for a shop or museum are shipped with two keys (one set as backup). 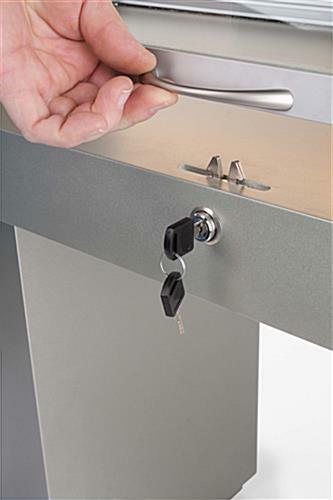 Please Note: This display uses keyed lock entry, and is automatically locked when closed. 47.8" x 38.0" x 17.5"